Angelina Jolie has rarely been seen out and about on both coasts without carrying her beloved Ralph Lauren Collection Bedford bag. Inspired by the classic English carry-all, the calfskin bag with custom brass hardware is the perfect bag for the super-busy Hollywood mom. Angie was first seen carrying the purse back in December while promoting her film ‘In the Land of Blood and Honey’ in New York City. The black leather provided the perfect contrast to the actress’ all-white Stella McCartney ensemble. Just days later, the bag popped up again in the Big Apple, paired with a chocolate silk Chloe dress, as the actress left a press junket for the film. She was spotted leaving the Egyptian Theatre following the American Cinematheque’s Foreign-Language Nominee Series in Hollywood, California looking tres chic carrying the bag. Our most recent Bedford spotting was as Angelina took her twin toddlers, Knox and Vivienne, shopping in Beverly Hills dressed in casual staples with the luxe carry-all. 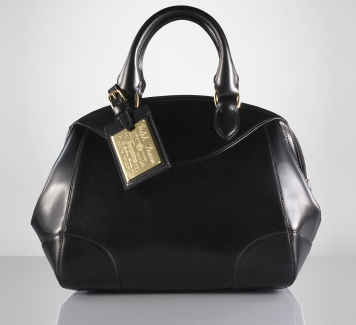 You can buy Angelina’s Ralph Lauren ‘Bedford’ bag in tan and black from RalphLauren.com.